Forklifts are the cause of thousands of injuries every year in the U.S., and according to recent statistics, 100 workers are killed in forklift accidents every year. A quarter of forklift fatalities are due to forklift overturns. Even so, many workers are still unaware of the dangers associated with operating a forklift, and many of these injuries and fatalities could have been prevented by simple precautions, such as installing safeguards in the workplace and by setting a simple requirement for workers: proper training. A man was recently killed in February while operating a forklift when it overturned. The man was trapped beneath the forklift after it tipped over when he was driving it up a ramp. The operator’s fellow ProBuild employees attempted to save him by pulling him from underneath the forklift, but the man had already passed away due to resulting injuries. 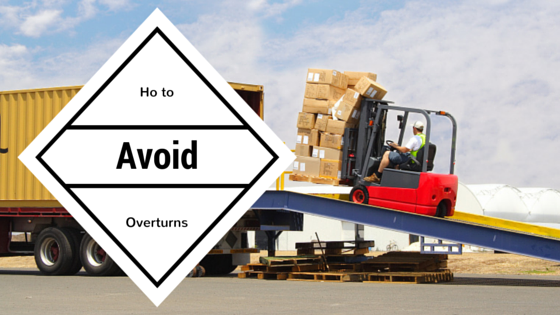 How Can Workers Avoid Forklift Tip-Overs? Understand the capacity of the forklift—what size and weight of a load can it handle? Assess and determine any unusual characteristics of a load—is it top-heavy, cylindrical, or awkward in any way? Inspect the condition of the forklift and know when something isn’t right—are the forks damaged or is there some other issue that could cause an accident? Assess the surrounding environment, looking at your location and where you are planning to go with the load—are there any obstacles, bumps, ramps, people, cross aisles, or narrow passageways to consider? Inform operators of sit-down forklifts that they can be crushed by the overhead guard after jumping from an overturning forklift—operators should never jump from a tipping forklift, and should remain seated, hold on tight, and lean in the opposite direction. Inform operators of stand-up forklifts with rear-entry access to exit from the lift by stepping backward if it starts to tip over. Make sure restraints including seat belts are always being used. Train operators to handle asymmetrical loads when their work involves this action. The reason why forklift certification is so important is because all of the preventative steps listed above can be learned through training. ForkliftCertification.com offers an online program that takes only about one hour to complete, yet it is 100% OSHA compliant and teaches workers everything they need to know to operate a forklift safely, inspect the equipment, perform maintenance checks, and assess the surrounding environment for safety hazards.